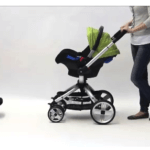 When you are planning to buy one stroller for your baby then I know you must be carry all the points which can be fit in today’s life style as you need to go out for shopping, travelling & for some other work, so Contours Bliss 4-in-1 Stroller System Review stroller will help you out to make your daily life easy with some very useful features like bassinet, car seat option with large canopy & wheels, reversible seat along with different safety features. This seat is suitable for new born to toddler & it’s not an all terrain stroller but it can absorb some of the lightly rough surface. Weight & fold is easy to handle, I guess that is enough for the introduction now we can start the discussion in details. It rolls on four never-flat wheels with 10″ wheels in the back and 8″ in the front. The front wheels are swivel, but can be locked straight if the terrain gets rough. There is a front wheel suspension system that helps to absorb some of the bumps. There is a foot brake located between rear wheels which are very easy to use & safe. 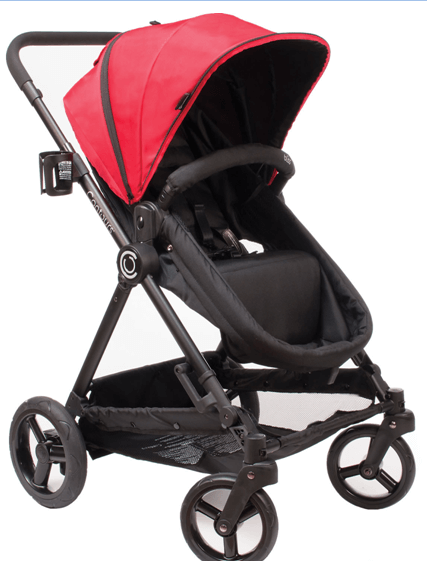 The canopy size is large & it goes all the way down to the bumper bar providing your child with full sun protection. It has a small plastic peekaboo window& the beautiful print inside the canopy is very attractive, there is a mesh for air circulation in summer days. The seat is very roomy & can hold a child from birth and up to 40 lbs. You can recline the seat up to three positions including flat one which is comfortable for infants & for sleeping position. To reverse the seat, take the baby out of the stroller, with one hand push a yellow button on each side of the seat. Next, lift the seat up using the bumper bar, swing it around and slide it into the frame until you hear a click. 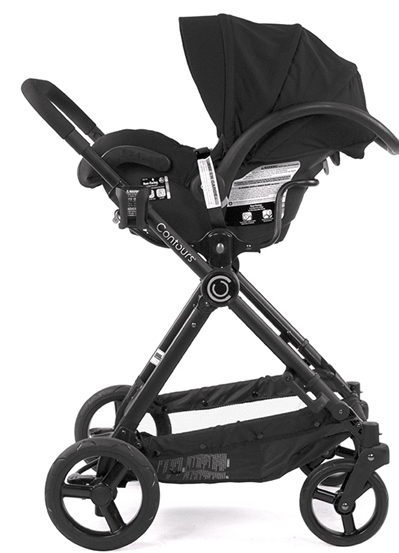 Contours Bliss 4-in-1 Stroller System stroller comes in with an infant car seat adapter (included) that fits over 20 most popular car seats. So there will be no issue for travelling. This seat can easily convert into a flat bed for a newborn. All you need to do is fully recline the seat and squeeze two clips at the bottom. Push the seat down till it’s flat. There is one padded seat liner to give extra support to your baby & you can take out the bed (pram) from the frame easily & keep it in your home, & the best thing is this can be done without disturbing your baby’s dream. It comes with a swing-away removable bumperwhich is included. It has adjustable telescoping handle bar adjusts from 39″ to 42″ from the ground. So you don’t need to regret about your height as this can be suitable for taller & shorter parents. 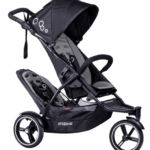 It has an adjustable padded 5 point harness with a double buckle in the middle, which will hold your child tight & safe. For more compact fold, you can remove the front wheels and the seat, it has automatic lock but unfortunately it doesn’t have standing fold which feel it should be there. For more comfort it has one foot muff included. 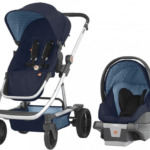 I know while reading this “Contours Bliss 4-in-1 Stroller System Review” for this section you will be expecting some good features so it has large basket in which you can easily put diaper bag & some of your shopping stuffs . It’s also very easy to access from all the sides. There is one cup holder included which can hold a bottle of drinks which is very useful. There are two storage pockets inside of the seat where you can store snacks, bottle or toys & some small essential of yours. Seat is softly padded & made of chemical free fabric to protect sensitive skin of your child, the material is easy to wash & handle. 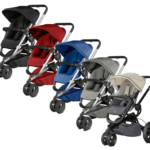 Contours Bliss 4-in-1 Stroller System Review stroller is available in three color combinations: gray/yellow, black/red & gray/black. 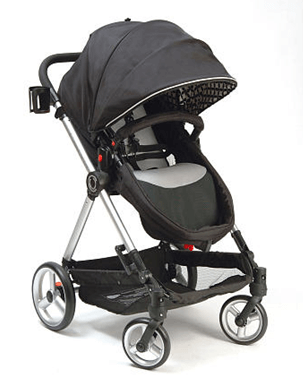 You may find it little bulky to handle but beside that all the features you will see is very much useful for you, Contours Bliss 4-in-1 Stroller System Review stroller is durable ,stylish & carries very good features with lots of pros & very less cons. 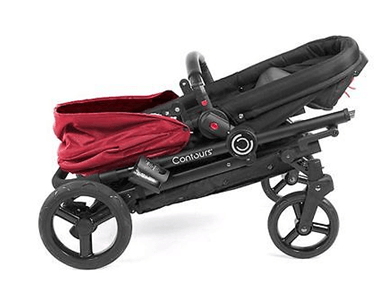 Contours have a one-year warranty on the frame of the stroller and 1 year on small parts and fabric. So just go through the article & make a right decision to make your baby ride happy & smooth.